Sometimes you set out to do something little and it ends up being more than you anticipated. Sometimes you think you are doing something to help yourself, but you find you have become part of a solution for others. Sometimes you discover the big picture through a small act. And most of the time, all of those discoveries help you feel not so alone. So… I did this little thing last year. It was just a spur of the moment decision, really. A click of a button during my coffee time one morning in May. It was a quick click in response to a frustrating week as a lupus patient. That click turned into something I wasn’t expecting. I really just wanted to be active in something after a spring season filled with medical uncertainties over which I had no control. I was tired of sitting around and waiting for things to happen. The medical drama of the past few months was weighing heavily on my mind and I was weary from being so focused on it. I wanted to have something to be excited about and something else to think about. The wrecking ball effect of lupus was affecting my mental outlook. That was not OK. It was time to find a solution and rise up. No more sitting down and waiting… I wanted to kick lupus in the a**. Oh… wait… that’s probably not polite to say. Well, you get the point. 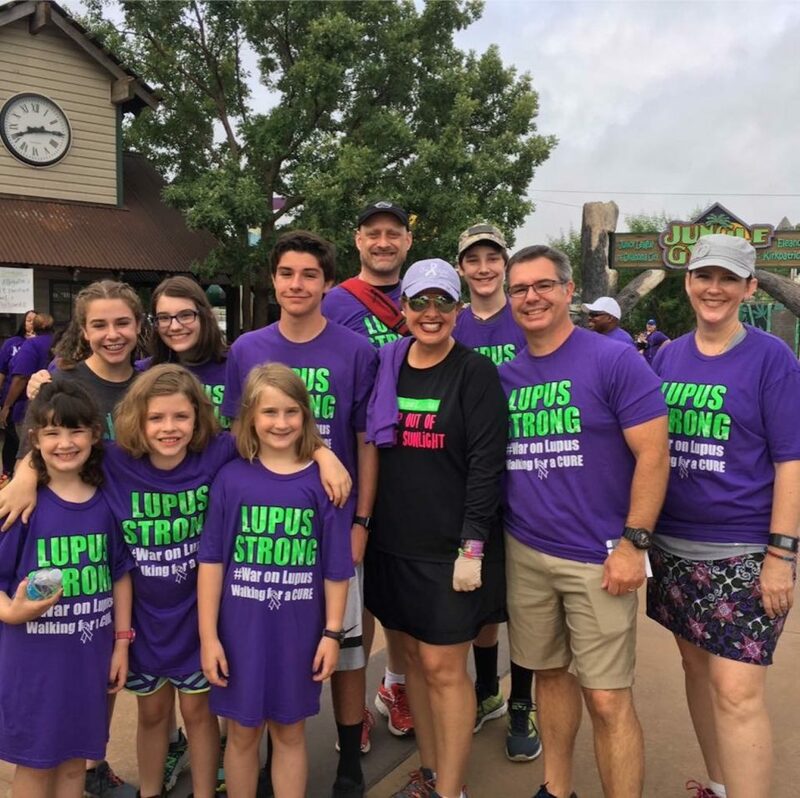 In a moment of resolve, I opened up my computer and got online to see what type of fundraising benefitting lupus research was offered in my area. After all, it was May, which is Lupus Awareness Month. There had to be something. And sure enough, there was. A walk was scheduled a few short weeks away in Oklahoma City, which is about two hours from me. I could join an already formed team, or I could start my own and do my own fundraising. Start my own? That was kind of scary. Who would join? Nobody would want to be bothered with something like that, would they? How would I even raise funds? Put it on my Facebook page? Just ask people? The whole thing seemed a bit daunting, but I decided to push on and see where it led. Thus, my team, “Kicking Asphalt for Lupus” was born. I gave myself a pat on the back for the witty team name, and I set my goal at a low $200. I felt like I would be doing well if I raised that much. After I formed my team, there was an option to let others know about my fundraising efforts through social media. I was leery about posting to my social media outlets because I didn’t want to bother people with a feeling of obligation to donate to my cause. I was afraid it would look like I was wanted attention, or that I would come across as pushy. I waffled for a second and almost backed out of the whole thing. Maybe this was too hard and not something I really wanted to commit to? My mouse arrow hovered over the “Share” button for a bit. Then I closed my eyes and… click. What happened next, stunned me. Within hours, I was getting notifications that people had joined my team. Many of my friends and family were making donations in my name to fund lupus research. There were notes of encouragement, there were friends who gave in ways that actually made me cry. There was an incredible amount of support that I had not expected. By that evening, I had blown away my meager $200 goal, which blew me away. Another amazing friend joined my team and added her fundraising efforts all the way in California. I was being surrounded by friends and family from all over and they were lifting me up through their support. I was exuberant! I felt like Sally Field, “You like me! You really like me!” I was feeling the love, ya’ll. And then I suddenly realized something else really important. That click made an impact on a whole community of people. Lupus is a woefully underfunded disease with very few drug advancements over the years. The lack of advancement means there are very limited drug options for lupus patients. Developing new medications is impossible without understanding how lupus attacks the body. Lupus patients need research dollars to understand our disease better. You can’t fight what you don’t understand. My fundraising would help funnel money into research that would support these efforts. But research is not the only place my fundraising would help. The money raised was also going to help lupus patients and their families in my area. It would help fund support groups, provide patient advocacy and give a valuable resource to those newly diagnosed, or walking a path where they found they needed extra resources. Whoa. And all I did was click a link during my morning coffee. And so, with the knowledge about the impact that I might be able to make, I increased my fundraising efforts. I put together a raffle to bring in more dollars. I increased my campaign and put it out there for the public to see. And it was working. Within a few weeks, “Kicking Asphalt for Lupus” had risen to second place in the state for fundraising. Boom. Take that, lupus. Suddenly, I didn’t feel so helpless anymore. I felt like I had actually done something for my community. It was a privilege to advocate for people other than just myself. The day of the walk dawned early, and I knew it was going to take an incredible effort to get out of the house on time with my three kids and my husband. Our travel time to Oklahoma City was about two hours and I don’t do early mornings. This… was going to be painful. Literally. I thought about skipping the walk itself and just mailing my check in. But I knew that was taking the easy way out, and I had friends and family encouraging me. So, I set my alarm for 5 a.m. and laid out my walking gear. My husband, our fearless leader, had us out of the house on time and put a cup of coffee in my hand. My three children did not complain once about their early morning… and they had all worn purple in my honor. I had my check all ready to deliver at registration. As we pulled into the Oklahoma City Zoo, the scope of the walk hit me. There were a lot of people! They were people like me… like us… lupus patients, friends and family, all pulling together to support a common cause. It was overwhelming to see. And then… the best part. As I walked up to the registration table, there was my best friend, her four children and her husband all there waiting for me. They had gotten up early and driven the two hours at dawn so that they could be there to walk with me. To sacrifice sleep for me? That is an incredible act of friendship. And because they were there, I was literally surrounded by friends and family (or “framily” as I prefer…) as we started the walk. It was incredibly moving for me. That walk gave me a wake up call. I realized that lupus isn’t just my thing. Those ripples from the disease have affected all the people in my life. The walk was filled with other patients just like me… it was filled with other people just like my family and friends. Just like my children. Just like my husband. Just like my parents. All of us have been affected by lupus. The gathering of all of those people was a complete picture of the impact lupus has on anyone it touches. Ya’ll. There’s a whole community out there, and every dollar I bring in through fundraising helps all those people. I hate lupus and the battle it has put my body through. But. I do not hate the direction it has taken my life. I do not hate the eye opening moments it has given me. I do not hate the perspective I have gained. And I love the opportunity to help support a community that I belong to. It is a privilege and an honor. And that is why I fundraise for lupus. And so, as Lupus Awareness Month comes around again, I find myself drinking my morning coffee and once again… click. Now, please excuse my social media fundraising efforts, and get ready… because I’m “Kicking Asphalt for Lupus” again this year!